2013 Five years after the release of Folie à Deux, Fall Out Boy issue their pop-leaning comeback album, Save Rock and Roll, featuring the hit "My Songs Know What You Did In The Dark (Light Em Up)." 2011 Ed Sheeran is due to play a free show at The Barfly in Camden, London. Over 1000 fans turn up, prompting Sheeran to play four separate sets, including one on the street outside the venue once it had closed. 2009 Brian McKnight is the seventh contestant eliminated on Season 8 of The Celebrity Apprentice. 2008 Lou Reed marries his third wife, the conceptual artist Laurie Anderson. The couple, who have been together since the early '90s, decided to get married the previous day, so they meet at a friend's house in Boulder, Colorado, and hold the ceremony in the backyard. 2007 Akon, who has a tendency to bring girls on stage and dance with them very suggestively, does so with a 15-year-old girl at a concert in Trinidad and Tobago. When video surfaces, outrage ensues and Verizon drops their sponsorship of the Sweet Escape tour, which Akon is supporting for Gwen Stefani. 2001 Gladys Knight marries her fourth husband, longtime friend William McDowell. 1999 Billy Joel's Greatest Hits Volume I & Volume II becomes just the fourth album certified by the RIAA as Double Diamond for sales of over 20 million in the US, following Thriller, Eagles - Their Greatest Hits 1971 - 1975 and The Wall. 1999 Backstreet Boys release "I Want It That Way." 1999 Country singer Boxcar Willie dies of leukemia at age 67 in Branson, Missouri. 1996 The Hollywood Rock Walk inducts Jan & Dean, The Ventures, The Chantays, and The Surfaris. 1993 Actress Lisa Bonet files for divorce from Lenny Kravitz. 1992 The Eagles' Don Henley leads 6,000 fans through Walden Woods in Massachusetts as part of a benefit walk to save the literally significant woods popularized by Henry Thoreau's work. 1990 Sinead O'Connor refuses to appear as the musical guest on Saturday Night Live in protest of the guest host, comedian Andrew Dice Clay. 1990 The Astronomical Union's Minor Planet Center in Arizona announces that four newly discovered asteroids, 4147-4150, will be named Lennon, McCartney, George Harrison, and Ringo Starr. 1990 James Brown is put on work release after spending months in jail on charges of drug possession and resisting arrest. He makes $3.80/hour counseling youths about drug abuse. 1989 David Cassidy's comeback begins when Los Angeles KLOS, to which the former Partridge Family singer is listening, wonder what happened to him. Before long, he's at the studio, performing three songs that land him a new record deal. 1986 Belinda Carlisle of The Go-Go's marries actor Morgan Mason. 1984 "Louie Louie Day" is held in Olympia, Washington, as an unsuccessful attempt is made to make it the official state song. 1979 Mickey Thomas, lead singer on the Elvin Bishop's 1975 hit "Fooled Around And Fell In Love," becomes the new lead vocalist for Jefferson Starship. 1978 The Four Tops sing at Aretha Franklin's wedding (the marriage lasts six years). 1975 Jazz entertainer Josephine Baker, the first black woman to star in a major film (Zouzou, 1934), dies at age 68 of a cerebral hemorrhage in Paris, France. 1975 David Bowie retires, for the second time. 1970 Alt rock singer-songwriter Nicholas Lofton Hexum (311) is born in Madison, Wisconsin. 1969 5th Dimension's "Aquarius/Let the Sunshine In" hits #1. 1968 The outspoken Frank Zappa performs at a dinner for the National Academy of Recording Arts and Sciences, who are the people who give us the Grammys. Zappa says the event is "a load of pompous hokum" and tells the audience, "All year long you people have manufactured this crap, now for one night you're gonna have to listen to it!" 1967 Greyhound begins offering tours of the Haight-Ashbury district of San Francisco, billing it as "Hippyland." 1966 #1 Billboard Pop Hit: The Righteous Brothers' "(You're My) Soul And Inspiration"
1966 Tom Jones enters a hospital to have his tonsils removed, though some who claim to have seen his tonsils since claim his real visit was for a nose job. 1964 Folk singer-songwriter Amy Ray (Indigo Girls) is born in Decatur, Georgia. 1964 Chubby Checker marries Miss World 1962, Catharina Johanna Lodders, of the Netherlands. 1962 Alt rocker Art Alexakis (frontman of Everclear) is born in Los Angeles, California. 1961 Ray Charles is the big winner at the third annual Grammy Awards, winning four trophies, including the award for Best Male Vocal for "Georgia On My Mind." 1958 Rock guitarist Will Sergeant (Echo & the Bunnymen) is born in Liverpool, England. 1957 Country singer Vince Gill is born in Norman, Oklahoma. 1956 German musician Herbert Grönemeyer, who also starred in the 1981 war film Das Boot, is born in Göttingen, Lower Saxony, Germany. 1954 At his first session for Decca Records, Bill Haley records "Rock Around The Clock" and "Thirteen Women" (a post-nuclear song that was originally the A-side of the single). 1954 Big Joe Turner releases "Shake, Rattle And Roll." 1950 David Cassidy is born in New York City to actor Jack Cassidy and actress Evelyn Ward. He'll become a teen idol and pop star thanks to his role as Keith Partridge on the musical sitcom The Partridge Family. 1947 Alexander Briley (The sailor from The Village People) is born in Harlem, New York City. 1940 Jazz musician Herbie Hancock is born in Chicago, Illinois. 1939 Woody Herman records "Woodchopper's Ball." 1932 Singer Tiny Tim is born Herbert B. Khaury is born in Manhattan, New York City. 1925 R&B singer Prentiss Barnes (The Moonglows) is born in Magnolia, Mississippi. 1925 Country singer Ned Miller, known for the 1962 crossover hit "From A Jack To A King," is born in Rains, Utah. 1921 Chicago blues musician Shakey Jake Harris is born James D. Harris in Earle, Arkansas, but would be raised in Chicago, Illinois. A professional gambler, he borrows his nickname from the dice players' expression "shake 'em." 1919 Orchestra leader and singer Billy Vaughn is born in Glasgow, Kentucky. 1917 Helen Forrest, girl singer of the Swing Era for Artie Shaw, Benny Goodman, and Harry James, is born Helen Fogel is born in Atlantic City, New Jersey. 1916 Composer and arranger Russ Garcia - The Benny Goodman Story (1956), The Complete Porgy and Bess (1956) - is born in Oakland, California. 1826 German composer Carl Maria von Weber travels to London to conduct the opening of his opera, Oberon. 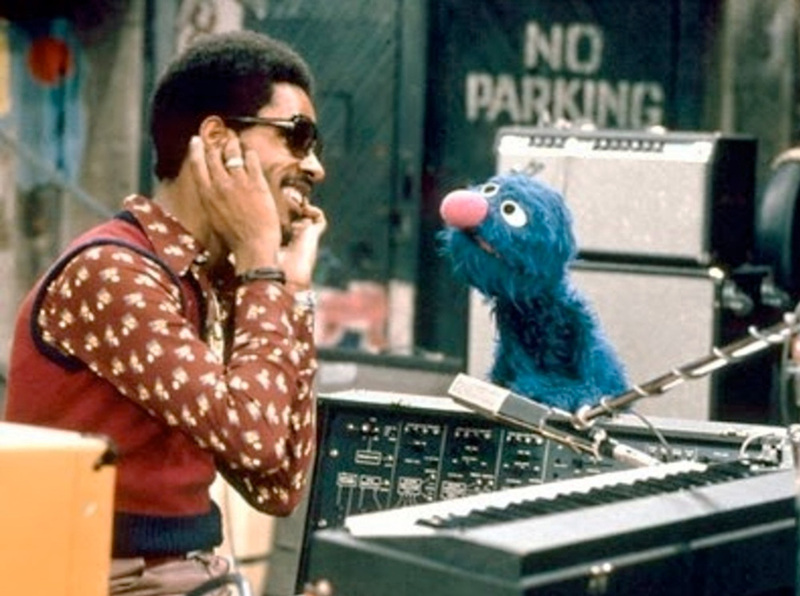 1973In one of the show's most memorable moments, Stevie Wonder plays a funky, 7-minute live version of "Superstition" on Sesame Street. 1989 Garth Brooks releases his debut album, Garth Brooks. 1988 Sonny Bono (Sonny & Cher) is elected mayor in his hometown of Palm Springs, California. He holds the position until 1992; in 1994 he is elected to Congress. 1983 R.E.M. release their debut album, Murmur. 1975 Elton John's "Philadelphia Freedom," named after the professional tennis team his friend Billie Jean King coaches, hits #1 on the Hot 100. 1966 In an eerie recreation of the duo's single from the year before, Jan Berry of Jan & Dean crashes his Corvette into a parked truck on Beverly Hills' Whittier Drive, near a stretch of road in Los Angeles known as Dead Man's Curve. Berry suffers paralysis and extensive brain damage, and will require four years of rehabilitation to be able to talk and a full decade in order to perform live again.